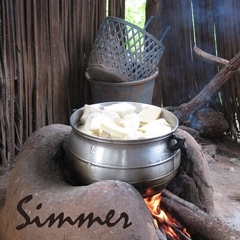 "Simmer" is a six-episode experimental series of 30-minute programs produced for Asheville's MAIN-FM in 2013. Host and producer Carla Seidl returned from teaching abroad in Azerbaijan and West Africa and sought to tie her experiences living in less economically developed regions to issues facing her community of Asheville, North Carolina. The program straddles art and journalism by combining interview with music, collage, and personal reflection. It aims to expand listeners’ awareness and sensitivity to other cultures and perspectives. The series served as Seidl's practicum toward her MFA in Interdisciplinary Arts at Goddard College.